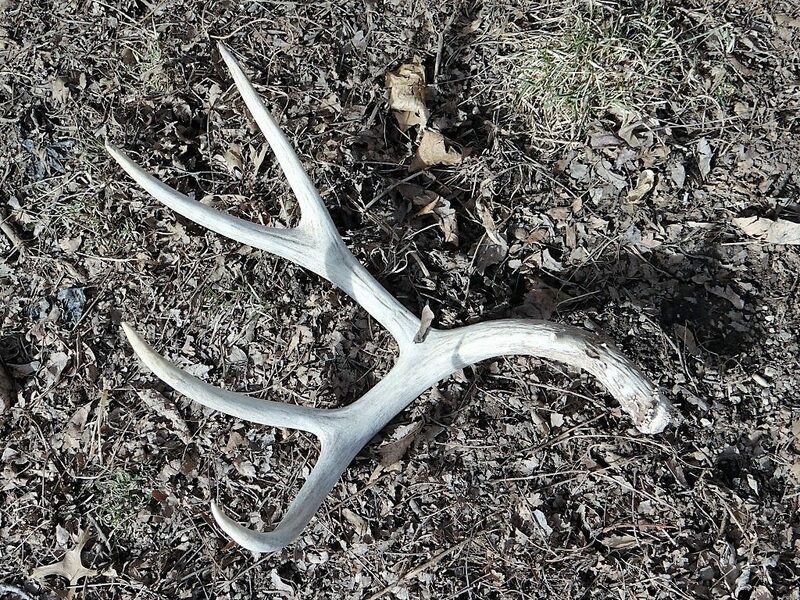 Home » Featured » Is It Time To Begin Looking For Shed Deer Antlers? Is it too early to go out and try to find shed deer antlers on my hunting lands? After all, there is snow cover and snow drifts in places. On the other hand, I am hearing rumors of bucks dropping their antlers earlier than normal on the Great Plains. A shed white-tailed deer antler atop snow cover in late January on a Sarpy County, NE farm. Photo by Greg Wagner/Nebraska Game and Parks Commission. So, when should someone venture to their deer woods and fields in search of those prized shed antlers? A white-tailed deer antler shed lays in the woodland habitat of a Sarpy County, NE farm on an early march day. Photo by Greg Wagner/Nebraska Game and Parks Commission. Beginning in late December and continuing through April, white-tailed and mule deer shed their antlers for regrowth purposes in Nebraska. 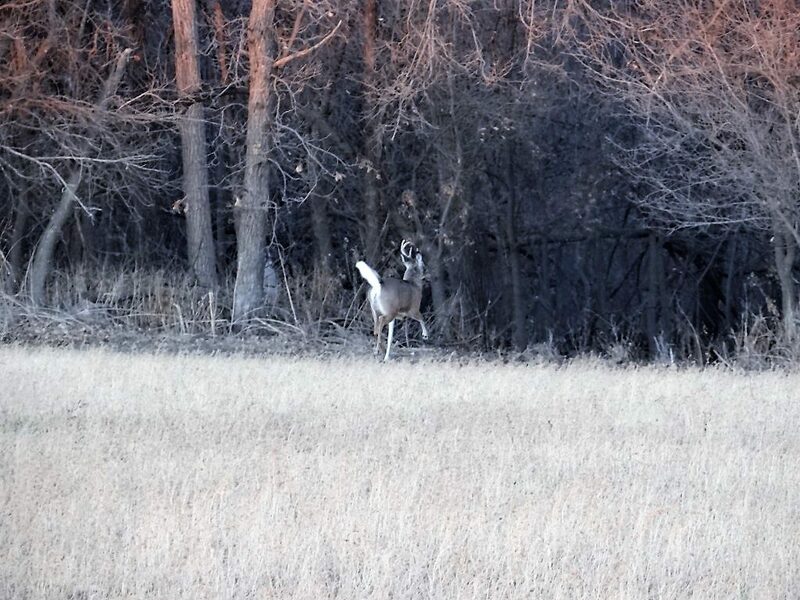 A number of deer in Nebraska drop their antlers in February and March. All members of the deer family – including elk and moose – drop their antlers each year and grow a new set. Antler shedding, or antler casting as it is called, is largely controlled by hormones (testosterone) and regulated by photoperiod (the length of daylight). Photoperiod is the trigger though. Yes, you are correct, just like the rut, photoperiod triggers antler drop, but conversely. 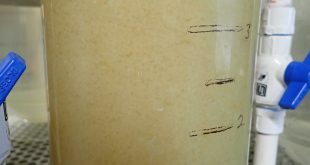 Photoperiod, defined as the amount of daylight, prompts changes in testosterone levels, which controls antler growing, hardening, and casting periods. Antlers usually fall off within hours of testosterone levels falling below the antler threshold limit. This process involves a layer of cells at the base of a deer’s antlers to begin reabsorbing calcium. Once that layer of cells deteriorates, the weight of the antlers will cause them to drop off. This is why so many sets can be found within a few hundred yards of each other! Since photoperiod is at the center of controls, you can expect healthy bucks to shed around the same time year after year. However, other factors impact them as well. Condition and nutrition are important. Studies show that bucks in good physical condition generally retain their antlers longer than those who are not. Early antler casting may be an outcome of a nutritionally stressed herd resulting from too many deer for what the habitat can support (carrying capacity). This can be caused by harvesting too few antlerless deer (does), or a single event caused by food alteration, reduction or failure, extended duration of flooding, extreme or prolonged cold and heavy snow cover, or some other environmental variable. Also, other incidents of early deer antler shedding most likely involve bucks that were injured in fights during the fall rut and cast their antlers early as a result. A close up of a shed white-tailed deer antler laying amid the forest floor of a woodland in rural Sarpy County, NE in early March. Photo by Greg Wagner/Nebraska Game and Parks Commission. Additionally, keep in mind that every buck is a unique individual, meaning what happens to one buck may be completely different from the next buck, even in the same herd! Nevertheless, why hunt shed antlers early? 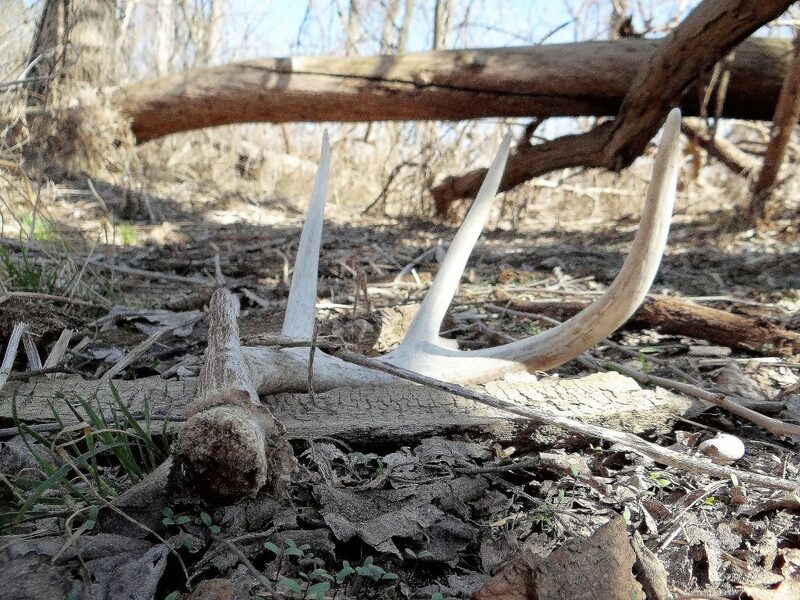 It is critical to shed antler hunt not too long after they drop for a couple of reasons. Once those hardened, blood-nourished bones hit the ground, they are immediately at risk of being gnawed by squirrels, mice, cottontail rabbits, foxes, coyote, opossums, beaver and other fur-bearing mammals plus other smaller mammals like porcupines and even some birds, I am told. Key nutrients are obtained by these animals from chewing deer antlers. They are calcium, phosphorus, protein, fat and fiber. If left on the ground long enough, antlers can be chewed to bits. Besides certain wildlife eating antlers, you also need to be concerned about other shed deer antler hunters getting them. As shed hunting continues to increase in popularity, more and more antler seekers are taking to the countryside just after late deer hunting seasons close. If you wait too long, you may miss out on antlers that have been on the ground a while! A shed mule deer antler laying along the edge of a thicket in rural Cherry County, NE in mid March. Photo by Greg Wagner/Nebraska Game and Parks Commission. 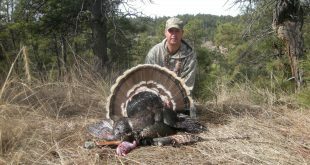 If you are new to shed deer antler hunting, it is really is a simple outdoor pursuit. It really doesn’t take much to do. You need to have permission from landowners to go on their properties, a partner (for safety), a Smartphone or iPhone (for map apps/GPS), the proper clothing, a decent pair of binoculars (to glass at extended distances) as well as a five-gallon bucket (hard-sided carrying device to help prevent getting impaled by antlers). Searching for antlers develops and hones skills for hunters and all outdoor enthusiasts. After a few trips, you gain an understanding of particular areas. You learn the use of habitat by wildlife, and the patterns of deer and other wild animals related to weather. You learn what white-tailed deer have for a winter diet that will also help on future, late season hunts. You learn that deer are creatures of habit — going to the same proximity to spend the winter every year. You also learn that shed antlers offer a snapshot of what particular bucks or what caliber of bucks survived the hunting seasons and are living in a given tract of land for next year’s seasons. Sheds also show the growth a buck experiences throughout their lifetime. This may allow you to predict growth over time while watching deer mature. Nonetheless, the question remains: Exactly where and when should a person go look for shed deer antlers? Answer: Anyplace where deer hang out regularly and their antlers can fall off, be jolted off or intentionally knocked off. Getting in to it further, here are some specific tips on where and when to find shed deer antlers. 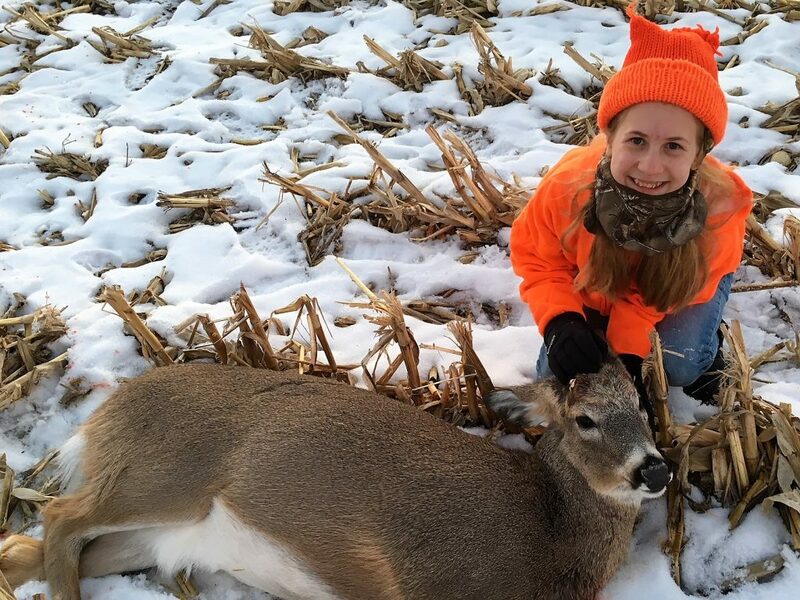 A 12 year-old girl happily displays her first deer harvested, a shed-antlered buck, taken in Nebraska’s 2018 late deer hunting season in rural Sarpy County, NE. Photo by T. Andre Shousha of Waterloo, NE. *HOW WAS YOUR LATE SEASON? During the late hunting season for antlerless deer, were any shed-antlered bucks harvested or one-antlered bucks seen in your area? If so, it may be time for your initial shed antler hunt! *FRESH SIGN. Intently look for fresh deer sign in the forms of tracks, droppings and beds which are obvious indicators that you may be near some shed antlers. Fresh deer tracks are most evident in snow and mud. Deer are grouped up or yarded up this time of year so sign should be easy to spot. *LOOK CLOSELY IN THEIR BEDS. Ovals in grass or snow denote deer beds. 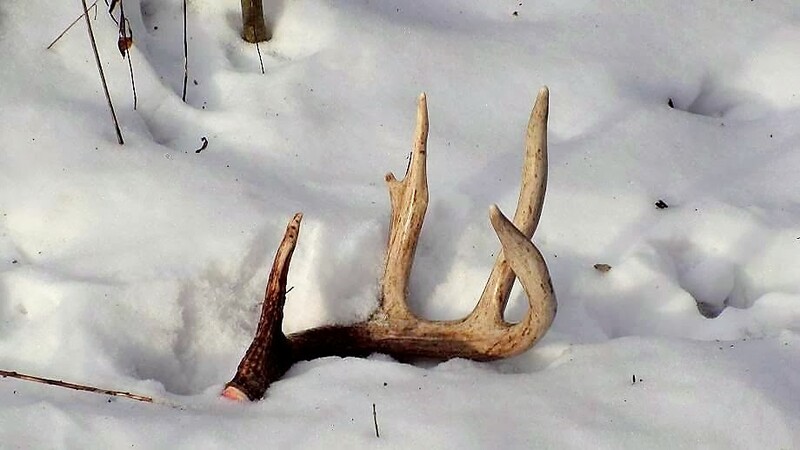 They may offer rewards for shed hunters because of the increased likelihood of finding matched sets of antlers, as well as small shed antlers. Be sure to look closely. *CHECK THE MENU. In winter, seek areas where deer concentrate to feed. Often, one field, most likely a cornfield that has not been tilled, that has dense woodland cover nearby, will draw all the deer while other fields are left untouched. *DON’T GO TOO FAR PAST THE BEDROOM. Do not overlook primary deer trails leading into or out of bedding areas for shed deer antlers. Deer trails along south-facing slopes with mature hardwood trees, conifers or plum thickets nearby that have lower-hanging branches are always productive. 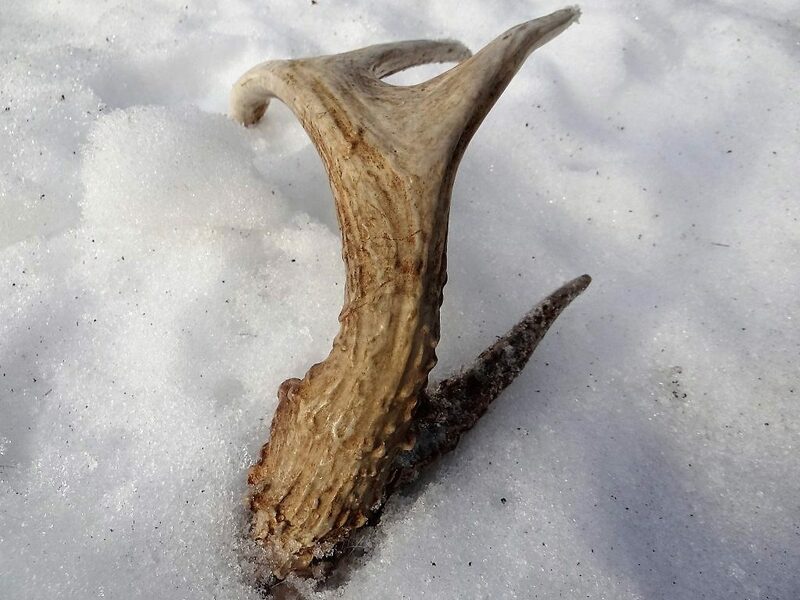 A shed white-tailed deer antler reveals itself in early February snow cover on a Douglas County, NE farm. Photo by Greg Wagner/Nebraska Game and Parks Commission. *ABOUT SNOW. Don’t let snow cover stop you from shed hunting either as the antlers, or parts thereof, can really stand out and be much easier to detect! Train your eyes for colors and shapes, like a tine sticking up out of the snow or the curve of a main beam. Deep snow, however, tends to concentrate deer into yards — making them easier to find but sometimes making antlers more difficult to locate. Very deep snow may put your antler hunting on hold for a bit. However, you can enlist some help from the canine corps. Some dogs seem to have a knack for finding sheds, others may need a little coaxing. There are even breeders now who specifically train dogs to find shed antlers. * WHERE THEY JUMP. 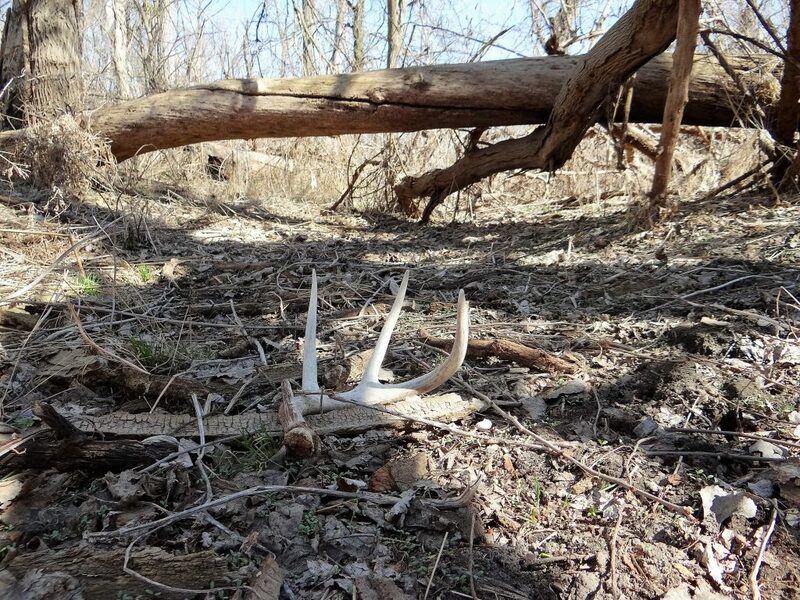 Any spot where a buck has to jump such things on their trails as fences, creeks, ditches, and large logs are all good places to search for shed antlers. *THE SPECIAL DAYS TO ANTLER HUNT. If you’re serious about finding shed deer antlers, you need to gear into or around what are referred to as the “special days” to hunt for them at appropriately spaced intervals. These are Ground Hog Day (February 2nd), President’s Day (3rd Monday in February), St. Patrick’s Day (March 17th), April Fool’s Day (April 1st), Tax Deadline Day (April 15th) and May Day (May 1). By hunting sheds on or near these days, you can help eliminate constant stress on deer, pushing them onto adjacent properties and frequently disturbing other wildlife. *THE CAMERA OPTION. Another option to know when to go hunting for shed deer antlers is to hang digital trail or game cameras around feeding areas like agricultural fields, or at least along the main trails leading to and from those feeding areas. Once the bucks in your images become antlerless, it will be time to start searching for sheds. *OTHER SHED HUNTING INFO. Believe it or not, rainy days are optimal days for seeking sheds because the antlers can shine and catch your eye. A quality pair of binoculars can also be a great aid in locating shed antlers at a distance. Kids should also be included in shed hunts as they are lower to the ground and are more apt to see sheds before adults do. Kids naturally have one of the most important components needed to be a successful shed antler hunter, curiosity! To find a decent amount of sheds, don’t forget that you’ll need to exert the extra effort and walk slowly for lots of miles. 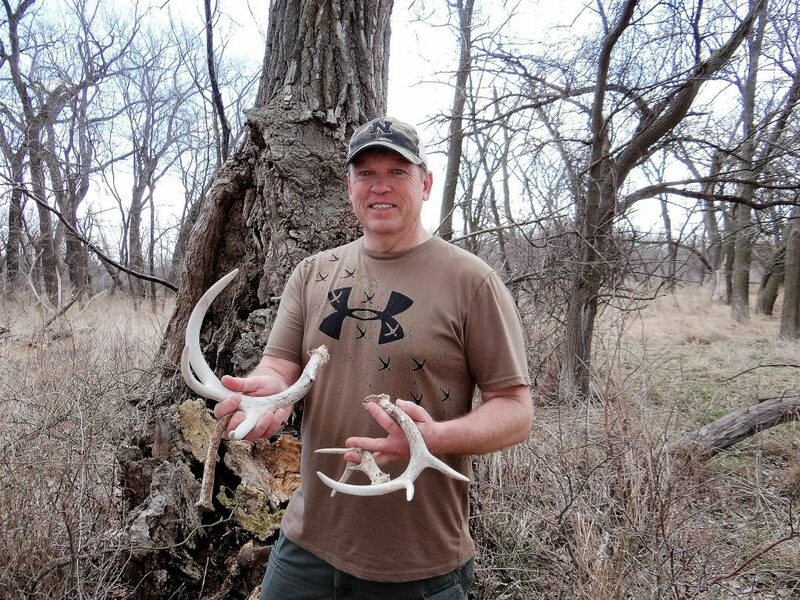 Nebraska Conservation Officer Rich Berggren of Waterloo, NE shows off shed white-tailed deer antlers he found during his day off in early March in rural Sarpy County, NE. Photo by Greg Wagner/Nebraska Game and Parks Commission.